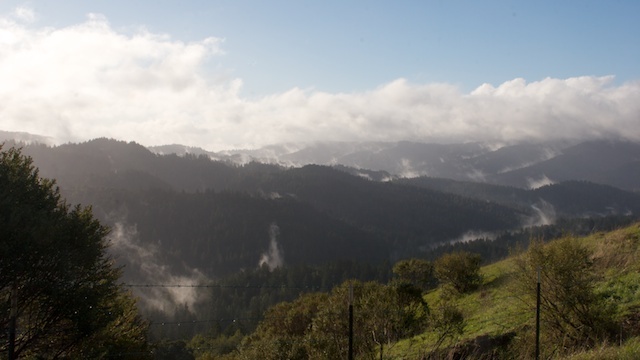 Storm clearing over the Santa Cruz Mountains. 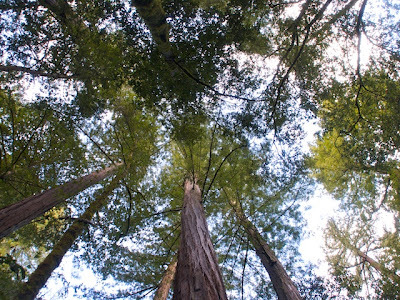 Portola Redwoods State Park is a beautiful redwood forest located off Alpine Road in the heart of the Santa Cruz mountains. 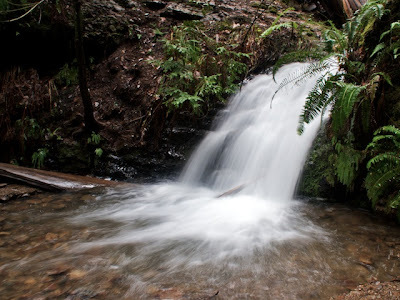 Though it is geographically quite close to Big Basin, Portola is a far more remote alternative especially in the Winter. We encountered two other hikers the entire day, both in the parking lot. Portola is also magnificently adjacent to multiple other parks creating opportunities for some big through-hikes that cover lots of ground. 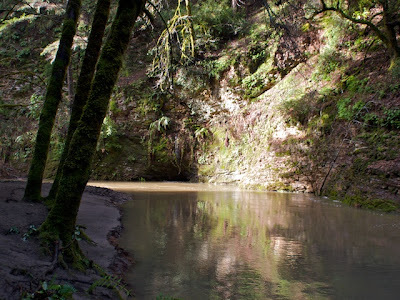 Normally a bridge fords Pescadero Creek, we found only a swift, deep muddy river. Swift and still impassable rapids. 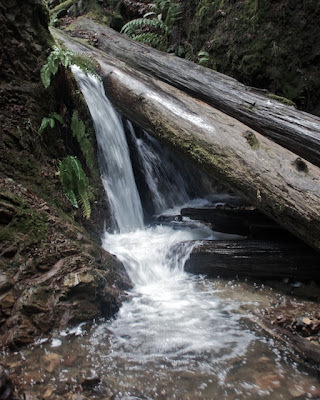 Before attempting any kind of a trip to Portola Redwoods State Park check to see that the bridges are up. 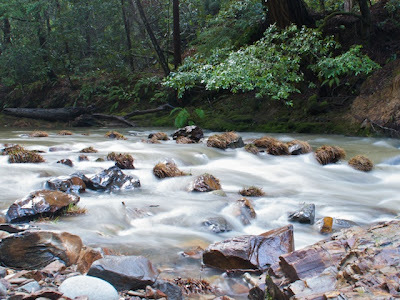 The rangers pull down the bridges over Pescadero Creek in the winter due to flooding. Quite honestly this seemed to be almost all the trail upkeep they did. 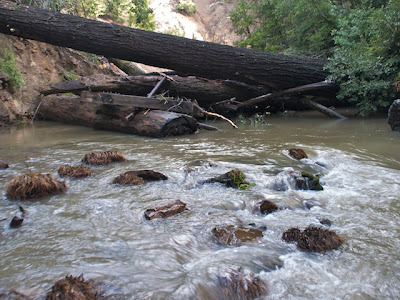 Maybe it was the budget cuts, or the recent heavy rains but the trail was frequently flooded and littered with downed trees not to mention one nearly impassable river. trees knocked down by the storm dammed up the river. Upon arrival in the park there was no signage to indicate that the primary bridge was down and that a 2 mile detour would need to be used which might be something the park would consider adopting. Consequently upon starting down the Sequoia Trail from the Visitors center once we encountered the storm-swolen Pescadero Creek my mom's cousin Ricky and I tried in vain for a solid hour and a half to find a safe crossing over the river. Towering redwoods near the Sequoia Trail. We eventually took the service road up to Old Haul road. Here we were lucky enough to find a permanent bridge near the Iverson Cabin Site. Within a mile of the Iverson Cabin Site we took a right in order to hook up with the Iverson Trail which crosses a small wood bridge over a creek immediately. We actually lost the trail at one point because a downed bay tree had obscured the trail for such a distance it became difficult to find again once we had navigated across its tangled limbs. The trail again hooks up with Old Haul Road before veering off again a 1/4th of a mile later continuing as the Iverson Trail. 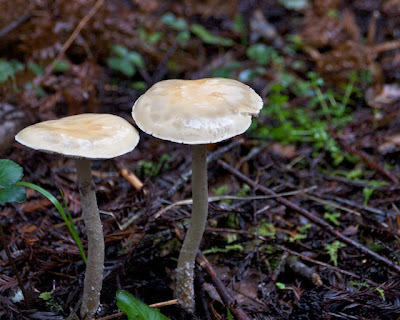 Mushrooms growing near a vernal pond. 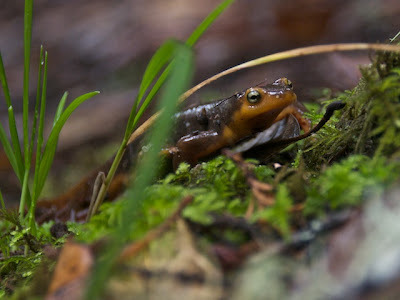 After passing several marshy areas and Vernal ponds the trail arrives at Tiptoe Falls. Probably a meer trickle in the Summer, the 10 or so foot high waterfall was not tall, but with the weather we had been having a flood of water was rushing off its lip and plunging into the pool at its base. By scrambling up a small rock wall we were able to access another small waterfall above it, also about 10ft tall. Running a bit low on time at this point we tried to cross the river one more time but it was simply running too fast and too deep to cross. To we retraced our steps back to the car over Old Haul Road. 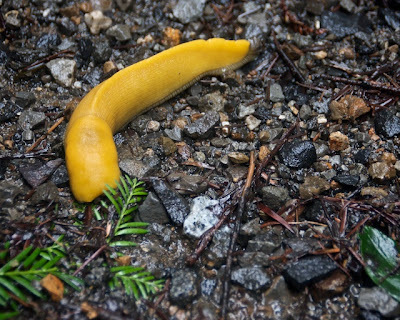 Rain brings out the Banana Slugs. I'd file this hike as a glorious failure. The total mileage came out to probably just under 5, most of that being retracing our own steps 3 or 4 times before moving on to someplace new. There is something to be said however for scrabbling over rocks and testing streams. It left plenty of time for photography and there were no sore muscles the next day.